The House You Want to Purchase is on a Septic System – Okay. Wait…What!? Clients are always surprised to hear that Chartwell, one of Severna Park’s most sought-after neighborhoods, is not connected to the public sewer. Actually, roughly 5% of the neighborhood is connect to the public sewer (the very north-eastern corner of the neighborhood), but that leaves the other 95% on private sewage disposal systems. This is not isolated to Chartwell as about 19% of houses listed and sold on the MLS in the past year in the Severna Park school district are not connected to the public sewer. This is data provided by agents, so we can be sure there are some inaccuracies and that the actual number is a bit higher. Some other notable neighborhoods in the Severna Park school district that are not connected to the public sewer are Chartwood, Point Field (2/3 of the neighborhood), Pointfield West, Crain West, Kilmarnock, Harlequin and just about all the homes south of Round Bay on the west side of Ritchie Highway, which includes some of the nicest houses in the district. I am going to focus on the basic septic system that we most commonly see in neighborhoods such as Chartwell. 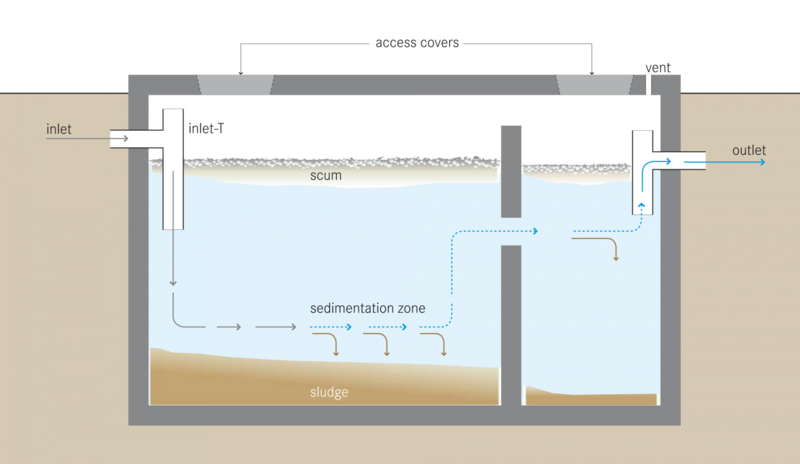 Waste leaves your house and rather than being directed into the public sewer, it enters a large tank buried in your yard, the Septic Tank. The septic tank can be made of various materials, but most commonly we see concrete. Through some very basic scientific wizardry, the tank separates liquids and solids, and pushes the liquids out to the Distribution Box. As its name implies, the distribution box distributes the liquid into one or more Drain Fields or Dry Wells. There are other possibilities here, but these are going to be the most common, with newer systems utilizing the drain fields. The drain field is an area of perforated pipes buried in trenches that allow the water to leach out and absorb into the ground, where it is then broken down over time into clean water and soil nutrients. The dry well works in a similar fashion, although as the name implies, this is a deep well which fills with water and then allows the water to drain out into the ground. Is a Septic System a Cause for Concern? There is no need to panic! Many people across the country live with septic systems, and while they require a bit more maintenance than being on the public sewer and will require a significant periodic cash outlay, similar to a roof or HVAC system, overall the experience is not significantly different. This nice thing about a septic system is there is no quarterly bill to pay to the county, and other than pumping every year or even less, you really don’t need to think much about it…until something fails. I’ll talk about the most common concerns related to the tank first, and then address the processing component. The tanks are usually very large and in this area, most of the tanks I have seen are concrete. Concrete tanks can have a very long life expectancy, some almost indefinite. According to Severna Park resident Robbie Beall, proprietor of Robert F. Beall & Sons, around the year 2000, new standards were put into place to ensure that modern concrete tanks will have extremely long lives. Some older concrete tanks will be able to survive indefinitely while others may not be thick enough or may have the wrong concrete mix, and will eventually crack and leak. A concrete tank can be replaced with a new concrete tank for around $5,000, as long as the homeowner does not plan on building any additions. Steel tanks were used in the past, but those have very limited lives and can be a real safety concern, as eventually the metal will break down and the tank could collapse. Any steel tanks still in service should be replaced immediately. Plastic and fiberglass tanks generally have shorter lives than concrete, but are not as susceptible to cracking. According to the county Permit Office, anyone looking to do an addition that would cause the house to exceed the size allowable on the current septic system, or anyone living inside of the Critical Area (within 1,000 feet of the water) that has a failing tank or is looking to add on, will need to install a new Pre-Treatment Unit. These are referred to by the county and MDE as nitrogen-removing BAT (Best Available Technology) units. These systems are much more technically complicated, and much more expensive than a standard septic tank ($10-15k installed). They also have ongoing maintenance costs on at least an annual basis. The good news is that there is funding available through the Bay Restoration Fund to help homeowners pay for these units. Homeowners with household incomes under $300,000 (possibly increasing to $330,000 in the near future) are eligible to have 100% of the cost of the tank and 5 years of maintenance paid for by the fund, while those with incomes over that amount are eligible for the fund to cover 50% of the installed cost. This funding is distributed based on prioritized needs and then on a first-come first-served basis, with new funding becoming available at the beginning of the fiscal year, July 1. Usually after a few months the available money starts to dwindle and funds become restricted to only failing units and critical area units, and then to only failing units in the critical area. In short, replacing your failing septic tank with a new concrete tank is the most cost-effective method, and should provide you with a tank that will last a lifetime, but may not meet county guidelines if you want to add on to your home someday, and is not an option if you live in a critical area. The BAT tanks can be cheaper to install if you can get the grant money, although there is the ongoing annual maintenance fee of approximately $200 and a shorter expected life for the tank. For any clients of mine that believe they may want to add on in the future, I strongly encourage them to upgrade to the BAT if they can get the 100% grant, as there are no guarantees if that grant money will be available when they need it in the future! One important safety concern for septic tanks and dry wells is the possibility of falling into the unit. Newer septic systems are required to have access ports for maintenance and inspection purposes, but it is important to make sure the lids are secure. The older concrete lids were unsightly and could crack over time, so they have been largely replaced by plastic lids. These lids are susceptible to damage from lawnmowers, driving over them and other unintended uses, and there have been cases where children have fallen through damaged lids, and often those lids flip back into place leaving no sign of what happened. There is also the possibility that if a lid is opened the poisonous gasses could cause you to pass out and fall in, which can result in drowning. Homeowners should take caution to make sure lids are secure and undamaged, and it is advisable to add additional protection over the cover. Most systems I see are currently operating with one or more drain fields (or Leach Fields) in place. These have a life expectancy of 20-30 years and cost about $10,000 to replace, assuming no complications. When looking to replace a septic tank with a basic concrete tank, the county will require you to show that you have space for 2 additional drain fields in the future, which need to be a certain distance away from property lines, wells, and incoming public water lines. While the county permit office has not encountered a situation where someone has gone through all three drain fields yet, by the time you have gone through all three drain fields, in theory, the first one should be back to a state where it could be utilized again, or at least a new drain field could go back into that spot. If space is limited, you could be required to upgrade to a BAT tank. Dry wells are no longer an option for new installations, but existing dry wells may be utilized. The main problem with the drwyells is that over time the amount of sewage that passes through the tank along with the water builds up and forms a layer on the walls of the well that will prevent water from absorbing properly. Once the well begins to fill up, it is failing. Some homeowners will treat the well with caustic soda to try to break up some of that build up, or have the well pumped out, which makes it equivalent to a holding tank. These are not good long-term options and when this happens the well needs to be cut off from the system. If there are other disposal systems available, such as a drain field or another dry well, a plug can be inserted in the distribution box so that the well can be cut off. Over time, usually about 7 years, the buildup on the walls of the well will deteriorate and break down, and the well can actually be utilized again. Should I Purchase a Home that is Connected to a Septic System? You really need to take everything into account and decide what would be best for you. I would not pass on the house of my dreams because it did not have access to the public sewer, but if the same house was available next door that was connected to the sewer, I would certainly pay more for that house. The most important thing you can do is have your system inspected by a qualified septic inspector prior to your purchase, and understand as much as possible about your system and how it operates. Once you have purchased the home, you’ll want to be careful to ensure that food scraps and grease are not washed down the drain (sorry, no garbage disposals should be used on a septic system for this reason! ), and that nothing other than toilet paper and wastewater are flushed down the toilet. More solids entering the system will mean that it will need to be pumped more frequently and it will have a greater chance of encountering issues. Finally, ongoing maintenance and pumping by a qualified professional is crucial. As always, please email me at eric@www.severnapark.com or give me a call at 410-804-8432 if you have any questions! 2017 Guide to Severna Park Pools!